‘’We did exactly what we wanted,’’ said Wong. 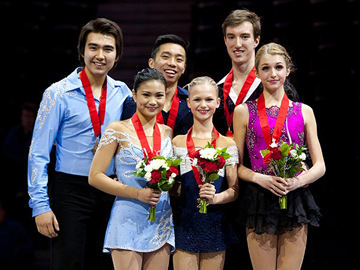 ‘’We had fun with it.’’ Knoblauch and Wong skating to Sing, Sing, Sing in the Short Program and Les Miserables for their Long Program had an overall score of 119.90 – breaking the National Record which had stood for a decade. 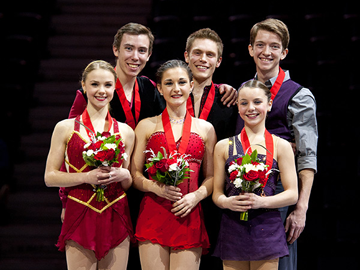 Congratulations Jamie and Cody – National Novice Pair Champions of Canada and Canadian Record Holders!!! Having only skated together three years, this up and coming team dazzled the audience with their renditions of Surely, I Love You and West Side Story. 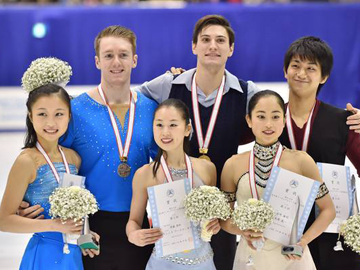 Having only skated together less than one year – Marin and Wes earned the silver medal in the Senior Pairs Event at the Japan National Championships in December, 2015. Set to the classic Singin' in the Rain, Rachael Dobson and Alexander Sheldrick’s long program opened with their recently-added triple twist, double axel and throw triple Salchow —well delivered as a whole for the first time in competition — and garnered enough presentation points to put the duo on the podium. 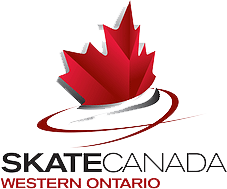 "If you are ready to move past Learn to Skate lessons, take your skating to the next level with Skate CTC"